Packaged food has carried labels identifying nutritional content on the back of the package since 1965. The food industry is responding to an anti-obesity initiative by First Lady by putting nutritional content information on the front of food packages. 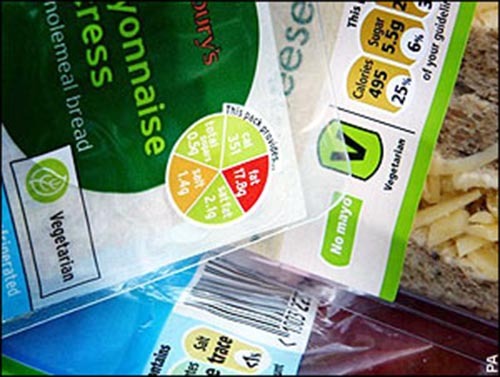 Will Putting Labels on the Front of Food Products Make Them Healthier? In 2009, the US Food and Drug Administration, which regulates food labeling, began a series of talks with food manufacturers. At the suggestion of Mrs. Obama, the FDA proposed to change the rules so that calories, fat grams, milligrams of sodium, and grams of sugar would be displayed on the front of any package of processed food. Since these are the measurements that are the most important to consumers trying to lose weight, the administration felt that prominently displaying them on the front of the package might discourage consumers from buying foods that keep them fat. Food manufacturers, of course, are not in the business of discouraging consumers from buying their products. Talks between the FDA and the food industry broke down when the manufacturers insisted they should also be able to use front-of-package labels to highlight beneficial nutrients, such as the calcium content of ice cream. However, the biggest player in the American retail food market, Wal-Mart, may be about to change the game for everyone involved. Shortly after the rest of the food industry finalized its resistance to the anti-obesity initiative, retail giant Wal-Mart announced a five-year plan to lower the calories, fat, salt, and sugar in its packaged foods, and to lower the price of fruits and vegetables. Wal-Mart executives say that this is their response to Michelle Obama's health initiative. Wal-Mart, of course, cannot change the content of products made by other companies. The company's plan is to lower fat, sugar, and sodium in the products manufactured under its house brand, Great Value. Among the first products to be reformulated are chips, dips, canned beans, and rice, dietary staples of low-income Americans. The New York Times reported that Wal-Mart was also pressuring some it suppliers to change their products, such as Kraft Foods, which sells 16 per cent of all its products in Wal-Mart stores. The retail chain also pledged to make whole grain products no more expensive than white flour products, and to reduce the price of fresh fruits and vegetables by reducing its profit margins. The company hopes to make up for lower prices by generating higher volume, and in the process punishing its competitors for not making commitment to healthier products sooner. Wal-Mart sells so much food that its decisions carry almost the same weight as decisions made by the FDA. Changes in the actual products on the shelves at the market, however, will not take place until 2015. Does the Fat Pulverizer Help with Weight Loss? Searching for chemical free cosmetics? Do Bad Habits Drive Up Your Triglycerides?